Shrubs which flower in late spring are easy to take for granted - the rhododendrons are busy showing off, and the roses are starting to bloom. 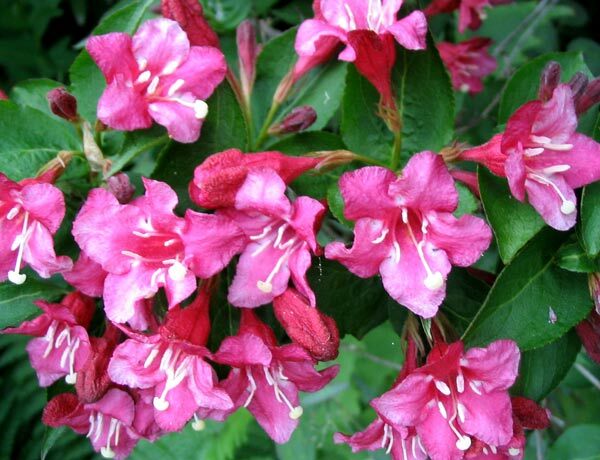 This beautiful red-flowering Weigela deserves to be noticed more. 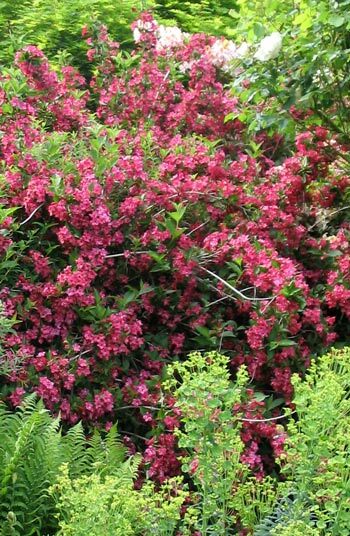 The Weigela lives in the Septic Tank Garden in a real shrubbery - with a deciduous Azalea, a pink Camellia, and a summer flowering Hypericum as neighbours. These plants were already planted in the garden ten years ago when we came to live at Mooseys - they would have been part of a typical traditional country garden planting scheme. This large shrub is happily in flower on the fence-line at the same time as the single climbing rose Sparieshoop and the fluffy Constance Spry start to flower - both roses are big and bright mid-pink in colour. Over the fence in the side Pond Paddock garden I've recently planted a wine-red flax (evocatively called Merlot) and a dark red weeping maple. With the Weigela flowering high above in the background the colour combinations in late spring are just beautiful. Everything looks so well designed! The red-flowering Weigela obviously needs colour echoes to be fully appreciated. The flowers are absolutely beautiful in close-up, as you can see from the photograph.